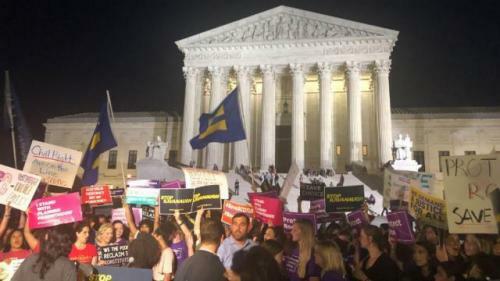 If you were not paying attention, you may think that the left is reacting to President Trump’s pick of Brett Kavanaugh for the Supreme Court. The reality is, the left was ready to protest whomever the President chose. Safe to say that leftists would protest even if the President chose a good Liberal for the court. This is because all leftists want to do is protest anything and EVERYTHING this president says and does. And its all because there is no love in their hearts or minds. They are seething all the time. They are the Party of Anger. Forget racial sensitivity training or gender equality training, I think they need some anger management classes. The left has moved on from intimidation to outright violence. So much so that even News people (notice I did not say Journalists) right of center are now too afraid to do live, out in the open reporting of the news of the day. She followed up that tweet with another, informing her followers that she was taking her show into her “safe” studio. That is from Fox News’ Shannon Bream. If you listen to what the left is saying and how they say it then you will know about their anger. All you have to do to trigger that anger is just mention Trump’s name or say MAGA. To prove it, when it comes to enforcing our borders and even separating illegal crossing children from their illegal crossing parents, just say Obama has detained these people and the left doesn’t bat an eye. But then tell them that now, President Trump is doing the same thing and watch them totally flip out on you. Be careful though. You may want to stay a safe distance from them when you inform them of their hypocrisy and stupidity and bigotry. Yea, they tend to flip out and go Postal when you point such stuff out to them.